2 Copyright © 2006, Intel Corporation. All rights reserved. Programs of the Intel Education Initiative are funded by the Intel Foundation and Intel Corporation. Copyright © 2007 Intel Corporation. All rights reserved. Intel and Intel Education are trademarks or registered trademarks of Intel Corporation or its subsidiaries in the United States and other countries. *Other names and brands may be claimed as the property of others. 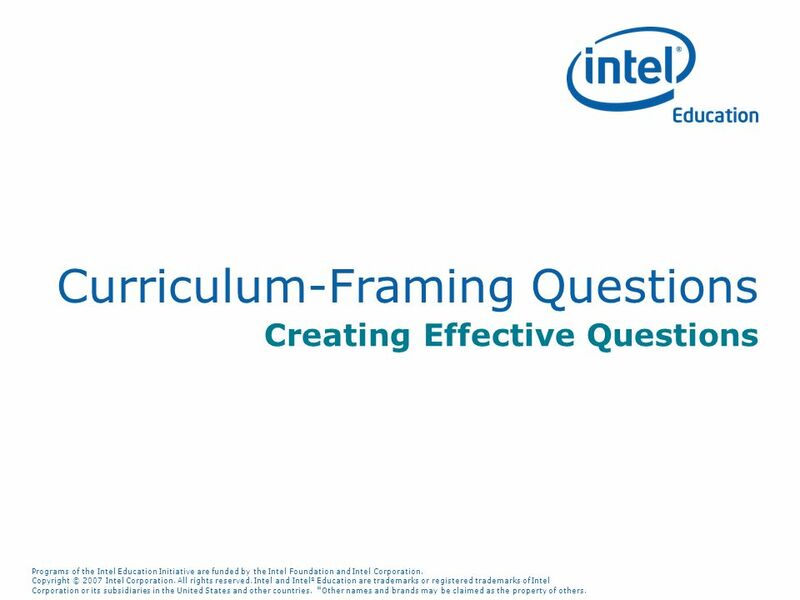 2 Curriculum-Framing Questions How can I create more effective questions? How can these questions help guide my teaching and unit planning? How can I help others develop good questions? 4 Copyright © 2006, Intel Corporation. All rights reserved. Programs of the Intel Education Initiative are funded by the Intel Foundation and Intel Corporation. Copyright © 2007 Intel Corporation. All rights reserved. Intel and Intel Education are trademarks or registered trademarks of Intel Corporation or its subsidiaries in the United States and other countries. *Other names and brands may be claimed as the property of others. 4 Why Do We Have Essential Questions? 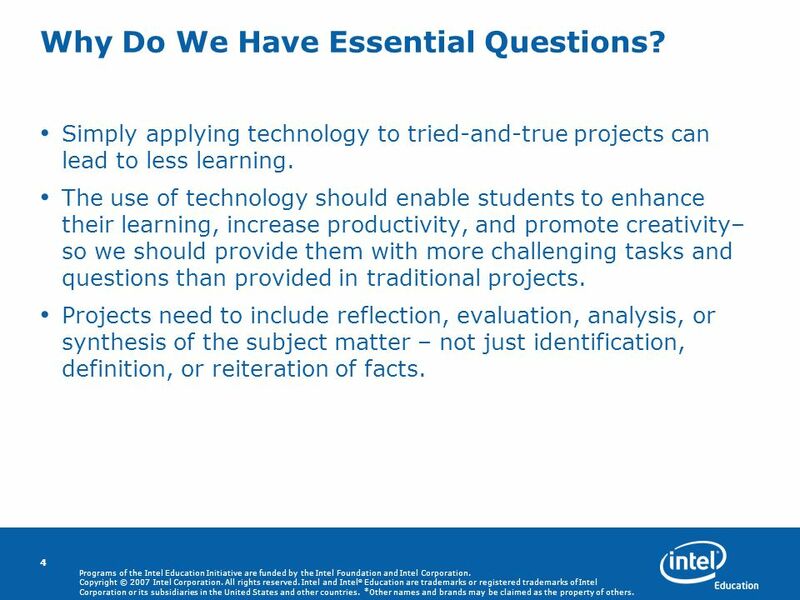 Simply applying technology to tried-and-true projects can lead to less learning. The use of technology should enable students to enhance their learning, increase productivity, and promote creativity– so we should provide them with more challenging tasks and questions than provided in traditional projects. Projects need to include reflection, evaluation, analysis, or synthesis of the subject matter – not just identification, definition, or reiteration of facts. 6 Copyright © 2006, Intel Corporation. All rights reserved. Programs of the Intel Education Initiative are funded by the Intel Foundation and Intel Corporation. Copyright © 2007 Intel Corporation. All rights reserved. Intel and Intel Education are trademarks or registered trademarks of Intel Corporation or its subsidiaries in the United States and other countries. *Other names and brands may be claimed as the property of others. 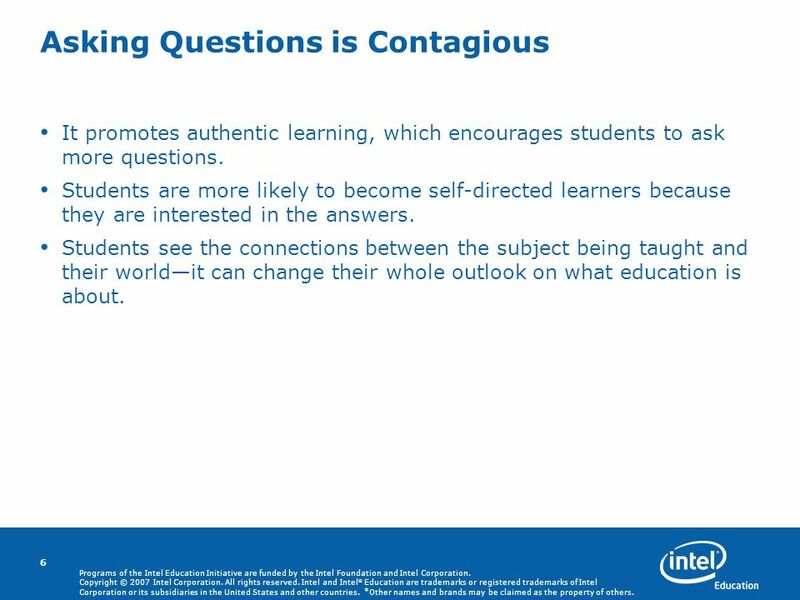 6 Asking Questions is Contagious It promotes authentic learning, which encourages students to ask more questions. Students are more likely to become self-directed learners because they are interested in the answers. Students see the connections between the subject being taught and their worldit can change their whole outlook on what education is about. 8 Copyright © 2006, Intel Corporation. All rights reserved. 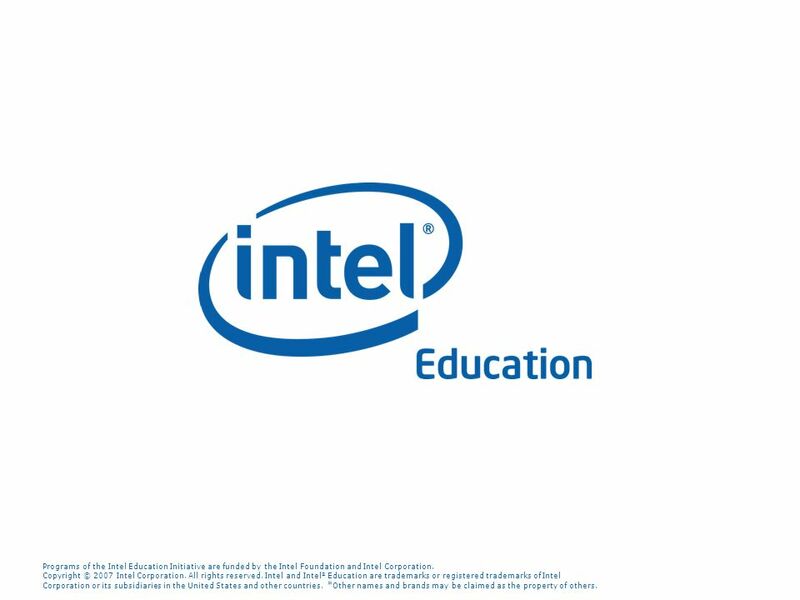 Programs of the Intel Education Initiative are funded by the Intel Foundation and Intel Corporation. Copyright © 2007 Intel Corporation. All rights reserved. Intel and Intel Education are trademarks or registered trademarks of Intel Corporation or its subsidiaries in the United States and other countries. *Other names and brands may be claimed as the property of others. 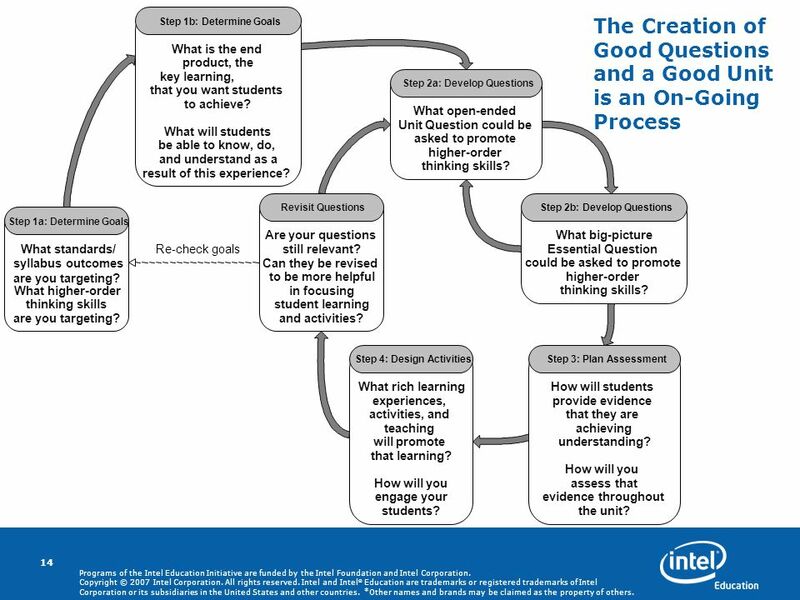 8 How Do Content, Unit, and Essential Questions Support Learning? 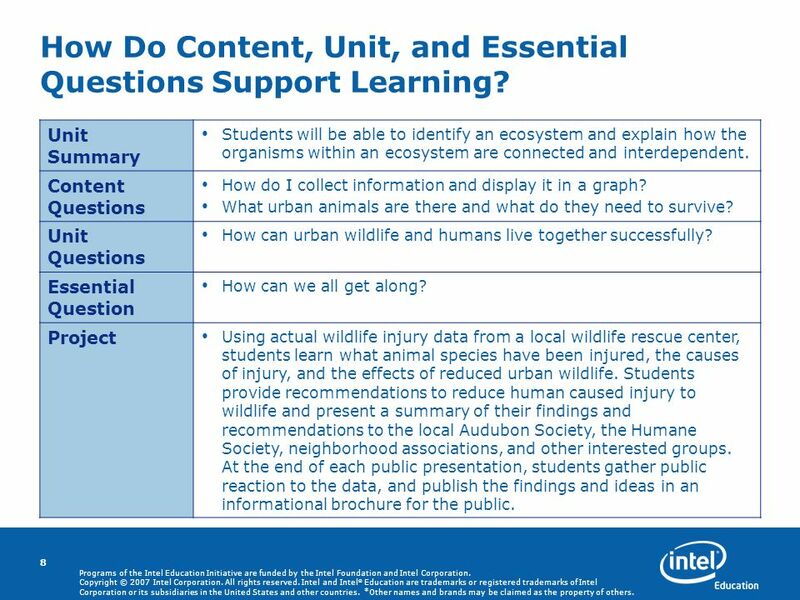 Unit Summary Students will be able to identify an ecosystem and explain how the organisms within an ecosystem are connected and interdependent. Content Questions How do I collect information and display it in a graph? What urban animals are there and what do they need to survive? Unit Questions How can urban wildlife and humans live together successfully? Essential Question How can we all get along? Project Using actual wildlife injury data from a local wildlife rescue center, students learn what animal species have been injured, the causes of injury, and the effects of reduced urban wildlife. Students provide recommendations to reduce human caused injury to wildlife and present a summary of their findings and recommendations to the local Audubon Society, the Humane Society, neighborhood associations, and other interested groups. At the end of each public presentation, students gather public reaction to the data, and publish the findings and ideas in an informational brochure for the public. 9 Copyright © 2006, Intel Corporation. All rights reserved. Programs of the Intel Education Initiative are funded by the Intel Foundation and Intel Corporation. Copyright © 2007 Intel Corporation. All rights reserved. Intel and Intel Education are trademarks or registered trademarks of Intel Corporation or its subsidiaries in the United States and other countries. *Other names and brands may be claimed as the property of others. 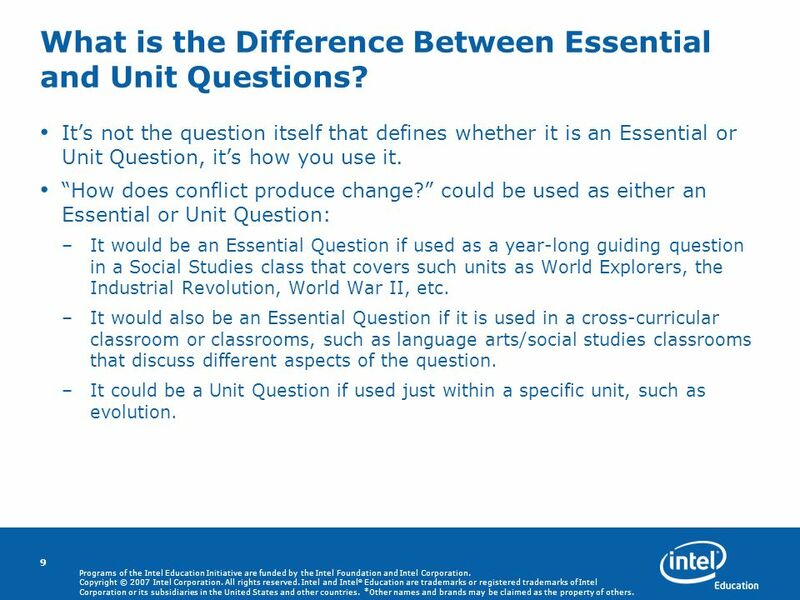 9 What is the Difference Between Essential and Unit Questions? Its not the question itself that defines whether it is an Essential or Unit Question, its how you use it. How does conflict produce change? could be used as either an Essential or Unit Question: –It would be an Essential Question if used as a year-long guiding question in a Social Studies class that covers such units as World Explorers, the Industrial Revolution, World War II, etc. –It would also be an Essential Question if it is used in a cross-curricular classroom or classrooms, such as language arts/social studies classrooms that discuss different aspects of the question. –It could be a Unit Question if used just within a specific unit, such as evolution. 10 Copyright © 2006, Intel Corporation. All rights reserved. Programs of the Intel Education Initiative are funded by the Intel Foundation and Intel Corporation. Copyright © 2007 Intel Corporation. All rights reserved. Intel and Intel Education are trademarks or registered trademarks of Intel Corporation or its subsidiaries in the United States and other countries. *Other names and brands may be claimed as the property of others. 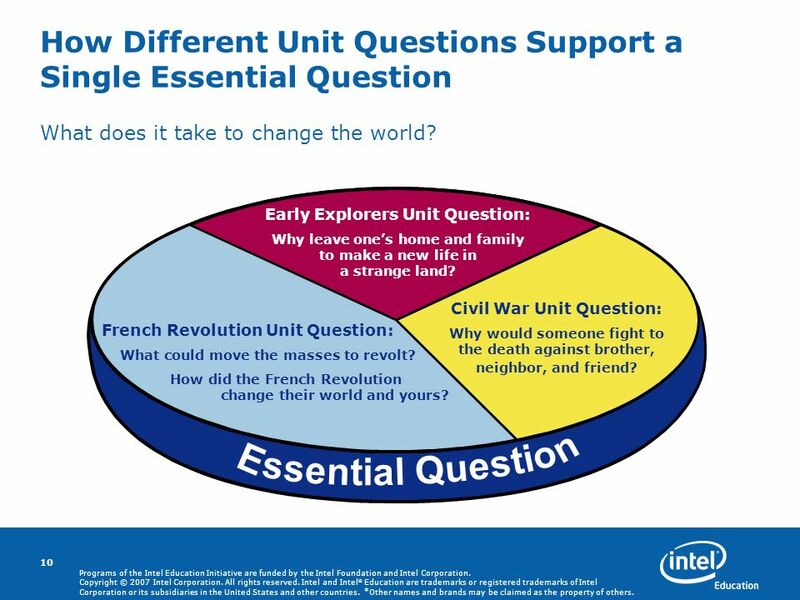 10 How Different Unit Questions Support a Single Essential Question What does it take to change the world? Early Explorers Unit Question: Why leave ones home and family to make a new life in a strange land? Civil War Unit Question: Why would someone fight to the death against brother, neighbor, and friend? French Revolution Unit Question: What could move the masses to revolt? How did the French Revolution change their world and yours? 11 Copyright © 2006, Intel Corporation. All rights reserved. Programs of the Intel Education Initiative are funded by the Intel Foundation and Intel Corporation. Copyright © 2007 Intel Corporation. All rights reserved. Intel and Intel Education are trademarks or registered trademarks of Intel Corporation or its subsidiaries in the United States and other countries. *Other names and brands may be claimed as the property of others. 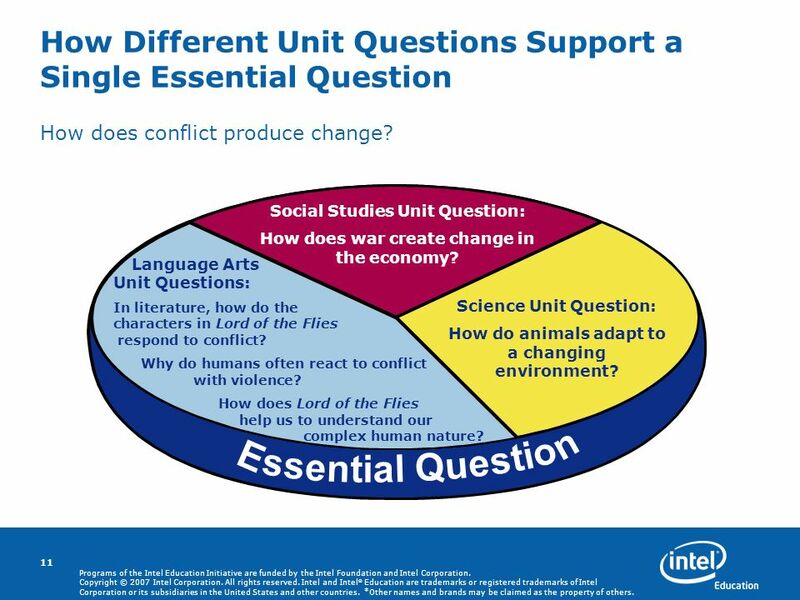 11 How Different Unit Questions Support a Single Essential Question How does conflict produce change? Social Studies Unit Question: How does war create change in the economy? Science Unit Question: How do animals adapt to a changing environment? Language Arts Unit Questions: In literature, how do the characters in Lord of the Flies respond to conflict? Why do humans often react to conflict with violence? How does Lord of the Flies help us to understand our complex human nature? 12 Copyright © 2006, Intel Corporation. All rights reserved. Programs of the Intel Education Initiative are funded by the Intel Foundation and Intel Corporation. Copyright © 2007 Intel Corporation. All rights reserved. Intel and Intel Education are trademarks or registered trademarks of Intel Corporation or its subsidiaries in the United States and other countries. *Other names and brands may be claimed as the property of others. 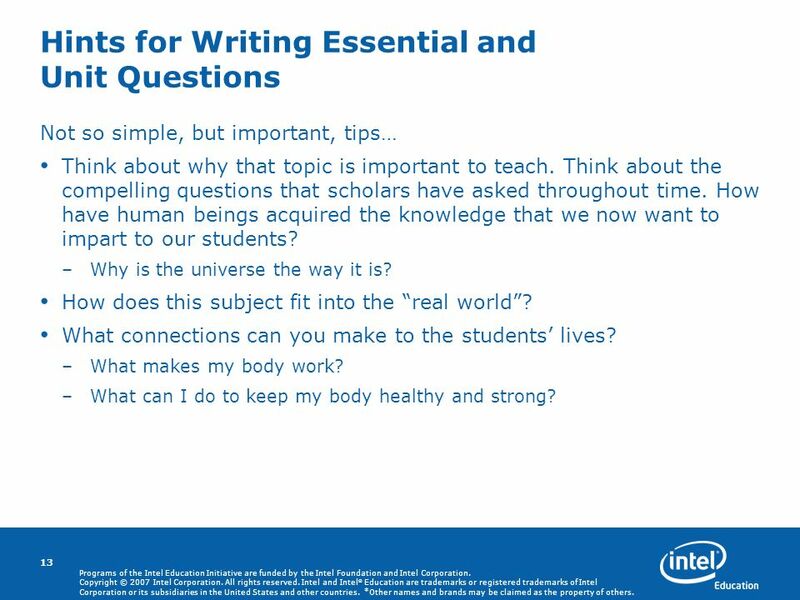 12 Hints for Writing Essential and Unit Questions Brainstorm questions on your own, then work with other teachers, or your own students, to refine them. 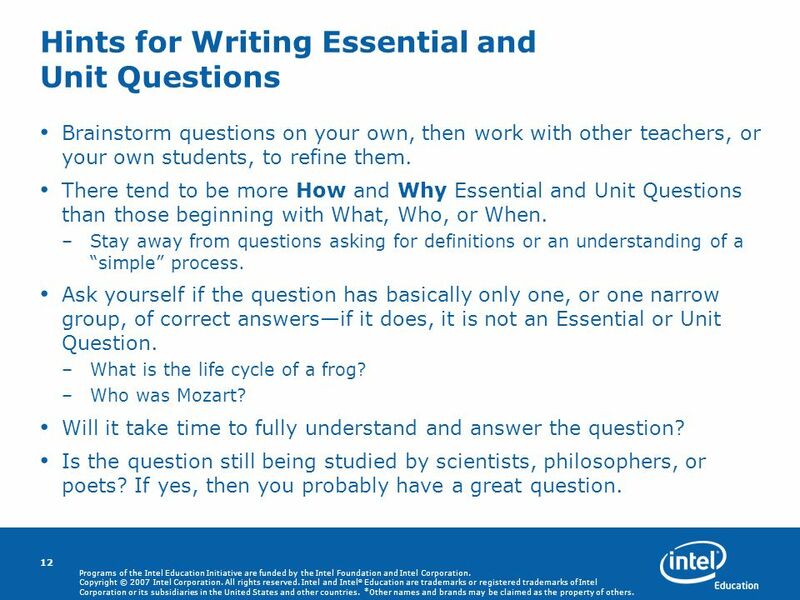 There tend to be more How and Why Essential and Unit Questions than those beginning with What, Who, or When. –Stay away from questions asking for definitions or an understanding of a simple process. Ask yourself if the question has basically only one, or one narrow group, of correct answersif it does, it is not an Essential or Unit Question. –What is the life cycle of a frog? –Who was Mozart? Will it take time to fully understand and answer the question? Is the question still being studied by scientists, philosophers, or poets? If yes, then you probably have a great question. 13 Copyright © 2006, Intel Corporation. All rights reserved. Programs of the Intel Education Initiative are funded by the Intel Foundation and Intel Corporation. Copyright © 2007 Intel Corporation. All rights reserved. Intel and Intel Education are trademarks or registered trademarks of Intel Corporation or its subsidiaries in the United States and other countries. *Other names and brands may be claimed as the property of others. 13 Hints for Writing Essential and Unit Questions Not so simple, but important, tips… Think about why that topic is important to teach. Think about the compelling questions that scholars have asked throughout time. How have human beings acquired the knowledge that we now want to impart to our students? –Why is the universe the way it is? How does this subject fit into the real world? What connections can you make to the students lives? –What makes my body work? –What can I do to keep my body healthy and strong? 15 Programs of the Intel Education Initiative are funded by the Intel Foundation and Intel Corporation. Copyright © 2007 Intel Corporation. All rights reserved. Intel and Intel Education are trademarks or registered trademarks of Intel Corporation or its subsidiaries in the United States and other countries. *Other names and brands may be claimed as the property of others. 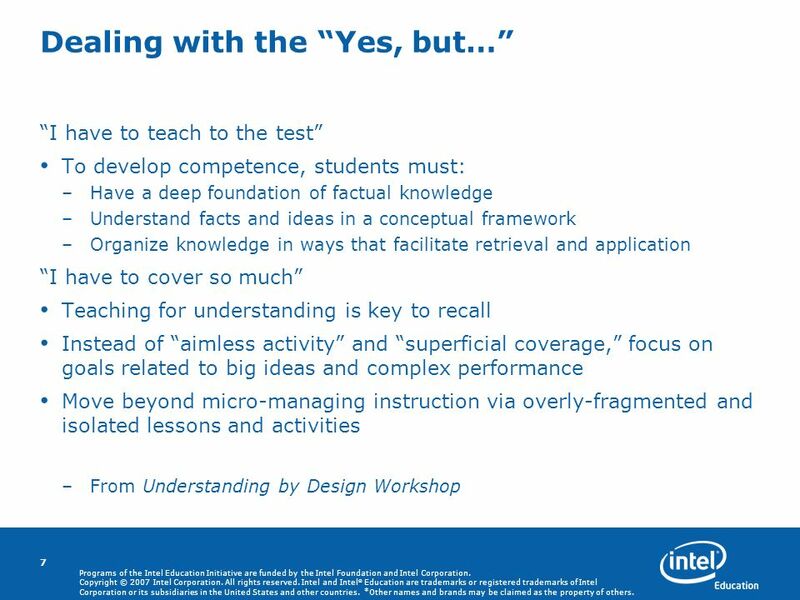 Download ppt "Programs of the Intel Education Initiative are funded by the Intel Foundation and Intel Corporation. Copyright © 2007 Intel Corporation. All rights reserved." Problem- Based Learning in STEM Disciplines Saturday, November 10, 2007 JHU/MSU STEM Initiative. 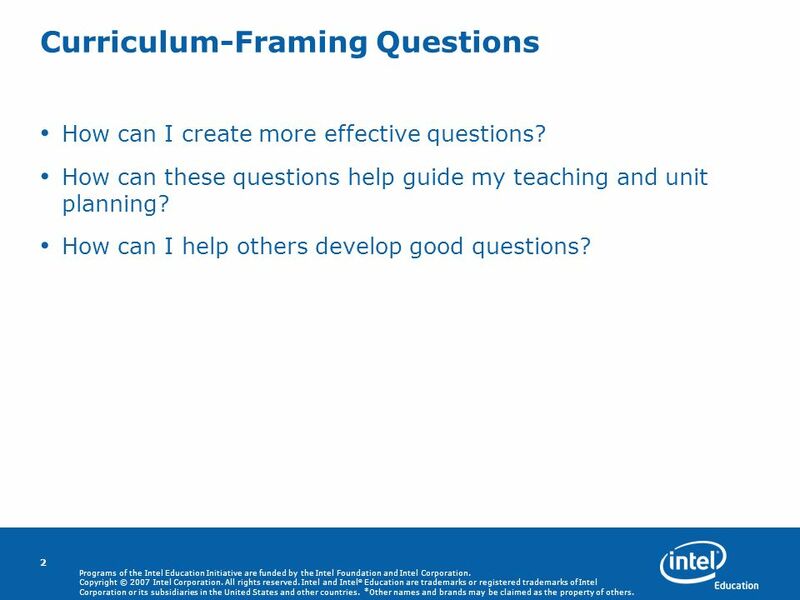 Curriculum-Framing Questions Part 2. Copyright © 2008, Intel Corporation. All rights reserved. Intel, the Intel logo, Intel Education Initiative, and.  2007 Mississippi Department of Education 2007 Mississippi Mathematics Framework Revised Training (Grades 6-12) Day 2. Elements of Constructivist Teaching Practices EdSe 4244 Social Studies Methods. Copyright © 2009 Intel Corporation. All rights reserved. Intel and Intel Education are trademarks or registered trademarks of Intel Corporation or its. Shameicha Wade Curriculum Specialist. 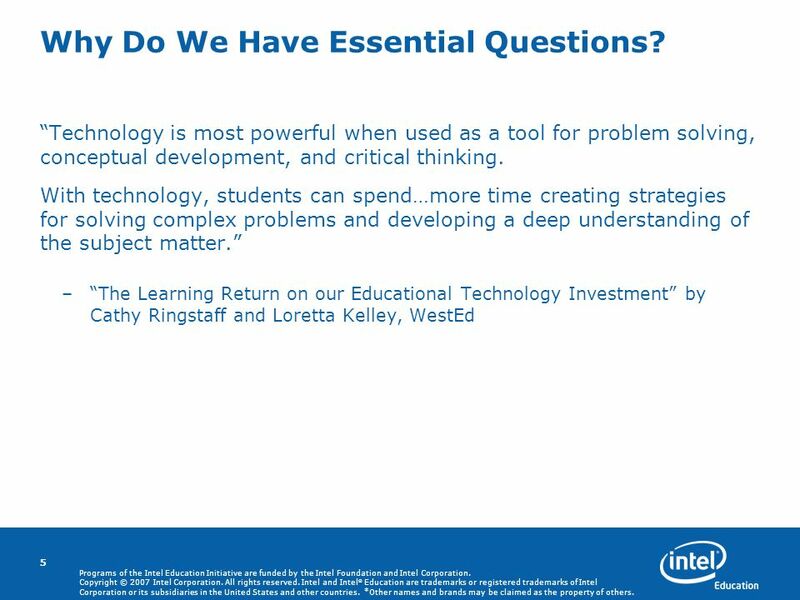 What is An Essential Question? Intel ® Teach Program International Curriculum Roundtable Programs of the Intel ® Education Initiative are funded by the Intel Foundation and Intel Corporation. Copyright © 2011 Intel Corporation. All rights reserved. Intel, the Intel logo, Intel Education Initiative, and Intel Teach Program are trademarks of Intel. 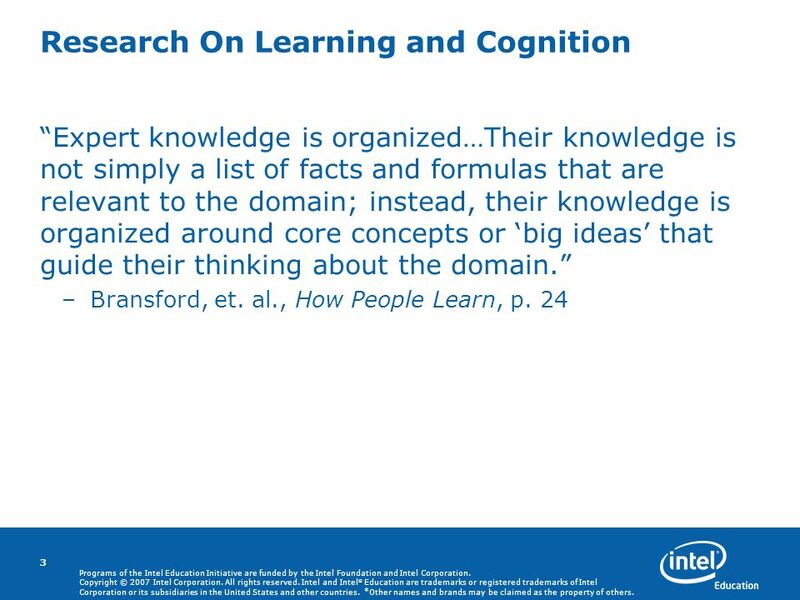 Rediscovering Research: A Path to Standards Based Learning Authentic Learning that Motivates, Constructs Meaning, and Boosts Success. Intel ® Teach Program Copyright © 2010 Intel Corporation. All rights reserved. Intel, the Intel logo, Intel Education Initiative and Intel Teach Program.